As an originator of vape juice, tobacco flavors were the tastes that started it all. In fact, the very first publicly available electronic cigarette contained a tobacco flavored e-liquid. As many are aware, there are trends, and those trends tend to fall off each year. One year people are crazed over custards, the next its lemonades or fruits. However, the one flavor that has stuck around and has been the backbone flavor for many entry-level and experienced vapers is the good and classic taste of tobacco. What’s fascinating is that since tobacco flavors are available in the vape form, this means there are hundreds and hundreds of brands that make a variety of the best tobacco vape juice flavors, from light to bold, and even tobacco flavors that are mixed with dessert flavors, fruit flavors, and menthols. There’s truly an endless amount of tobacco vape juice, and in this article, we wanted to feature the top five best tobacco vape juice of 2019. Though there are now millions of us that got away from cigarettes, cigars, and pipes, there is still a large number of people who miss the remarkable taste of a tobacco flavor. What’s incredible about tobacco vape juice is that these flavors require an outstanding skillset from mixologists to create blends that capture both the flavor and experience of the world’s best tobaccos. Fortunately, we have some bright minds in the vaping industry and these skilled mixologists are able to deliver that extraordinary taste of tobacco but without the harmful smoke. While there are many blends that we would love to share, we’ve narrowed it down to five outstanding tobacco vape juice flavors, which have exceeded expectations and is considered around the world as the best tobacco vape juice. Allow us to take a moment more of your time so that you can browse our selection of the top 5 best tobacco vape juice of 2019. Django by 13th Floor Elevapors is one that has become extremely popular due to its highly complex taste. This outstanding blend delivers that most sought-after tobacco taste and experience while delivering it all in a vape form that you can truly appreciate. When you try this brilliantly blended tobacco vape juice, you’ll immediately taste a combination of vanilla milk and caramel with just the right dose of authentically-tasting Kentucky flue-cured tobacco leaf. The experience from the taste and the way this brilliantly crafted flavor has been blended will give you that “ahh” satisfaction you’ve been craving. Tobacco enthusiasts can really appreciate Jon Wayne by Uncle Junk, as it delivers a smooth, full-bodied experience from an American tobacco flavor that truly tastes authentic. This extraordinary tobacco blend is one of the most savory vapes you’ll ever have a chance to try, delivering the perfectly sweet twist on a classic tobacco vape juice that you wouldn’t expect. Enjoy the remarkable blend of sweet cream, thick honey caramel, and American tobacco. From the rich silky cream to the rich honey to the classic taste of tobacco, this is definitely a tobacco vape juice that you don’t want to go without. While Naked 100 is a brand known for its amazing fruit-flavored vapes, it’s also a brand known for its incredible variety of flavors. In fact, Naked 100 has its own tobacco vape juice collection, and one of them has gained an extraordinary amount of attention from both smokers and vapers all across the globe. American Patriots by Naked 100 is a tobacco vape juice that comes from the Naked 100 Tobacco series, and out of them all, it has become the most popular. It offers an outstanding blend, delivering the same great flavor you would experience from those red packs of traditional cigarettes. Those cigarettes and this specific flavor are what originally made the American Cowboy famous throughout the years. The only difference today is that you can experience the same taste without the harmful smoke from cigarettes. 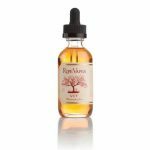 Ripe Vapes is another incredible brand within the industry that made a tobacco vape juice one of its priorities. In fact, Ripe Vapes creates one specific flavor that features a highly complex blend where there are layers of sweet and savory flavor that are desired by many. VCT by Ripe Vapes shares a creamy vanilla custard base, a slight dazzle of toasted almost for a delicious twist, and finished with fine pipe tobacco that you are sure to appreciate. Just imagine the remarkable taste experience of vanilla custard, almond, and tobacco. For those that are over the bold taste and are looking for something light, Euro Gold by Naked 100 is the tobacco vape juice you just have to experience. While this blend is a complex one as far as the process that goes into creating it, it’s actually with of the most simplistic tobacco flavors on the market, and many believe that is what makes Euro Gold so enticing to the tastes. With this brilliant flavor, you’ll enjoy an exceptional taste that has a light body tobacco blend, boasting an incredible smooth vape with each draw.